Compared to others I probably don't have that many. My financial consultant said she has about 200 pairs of shoes in total. 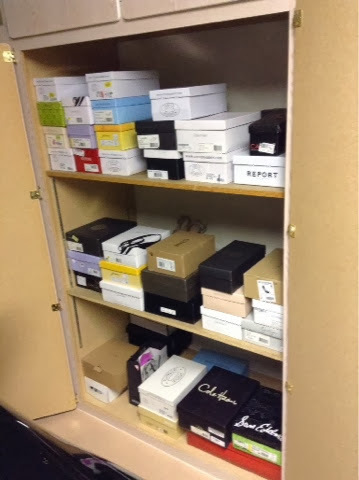 One of my teachers in high school said she has around 100 or so pairs and they're all organized in shoe boxes with pictures of each pair shown on the outside of matching its matching box. Bottom line is that, it doesn't matter how many pairs of shoes you own. What matters is, how do you organize your shoes? 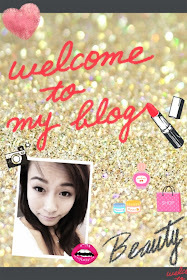 Fashion bloggers that I follow seem to have less than 100 pairs, but each of their pair run for no less than $300. Therefore, I often see pictures of these fancy shoes being stored in the closet along with their expensive clothes. It makes the closet looks nice wgile adding some aesthetic looks to it, but I don't totally agree with this idea... I mean realistically! Do you really want to store all the dirt get stuck on the bottom of your shoes in the your closet with your clothes? It doesn't matter how expensive the pair of shoes may be, shoes are shoes and they meant to be for you to walk on. They deserve a seperate place, away from your clothes! I chose to put all my shoes in a built-in storage in the garage. First of all, I wanted to make sure that they have doors to prevent my shoes from getting dusty. Secondly, the garage is the perfect place for to store all my shoes because it is so convenient, on my way out to the car. Of course, I make sure I have a mirror put near by to pull the look together! 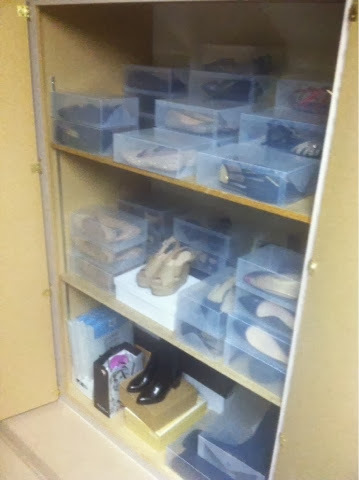 Though my storage has doors, but I still fear my precious shoes somehow might get dusty. So I make sure to keep all the shoe boxes along with the paper wrap liner inside and I would consistently put my pair of shoes back into the box after each use.. Of course, wrap the paper liner around them before closing the lid! I enjoy doing this most of the time because it makes me feel like I'm wearing a new pair each time and just the act of taking of my precious shoes is special. However, as my collection grows and I try to organize them in the same colors and styles for the convience of finding the right pair fast when needed. Especially, when I'm running late, I get a little frustrated and can't remember which is which so I'd hopelessly flip the lids open and try to find the right one... Urrgh...! Don't you need to be able to ser the entire collection of what you have, at the same time keeping them away from dust? 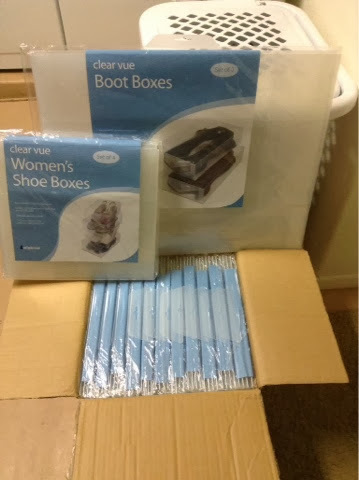 Clear Shoe Boxes is the solution! Found these at Walmart.com for about $11.94 for a set of 4. So I decided to order 12 sets of them (4 boxes per set).